Bulk precipitation is collected in the open field, at a location <500 m from the Level II plot. The samplers are placed at a distance of at least 3 times the height of the nearest trees to avoid interfering turbulence. 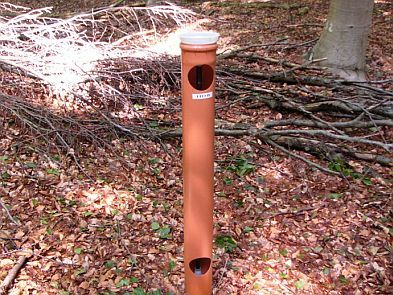 Near each Level II plot 4 identical rain gauges are installed to sample bulk precipitation. 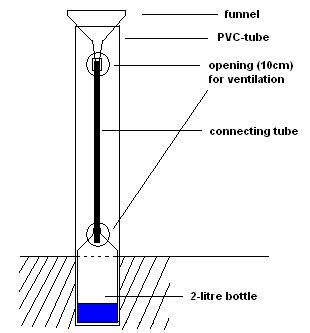 Each sampler consists of a PVC tube, with on top a PE funnel (inside diameter: 14 cm), connected by a black PE tube to a 2 litre PE collecting bottle which is stored in soil pit to keep the sample cool and in the dark. In the funnel a 0.45 mm spaced mesh is placed to prevent contamination of samples. As this type of sampler is continuously exposed, samples consist of a mixture of wet and dry deposition (bulk). Sampling is performed 2 times per month. The volume collected by each individual sampler is measured. Then the total volume collected by the 4 samplers is combined to a mixed sample, of which 500 ml is transported to the laboratory for chemical analysis. Samples which are visually contaminated (bird droppings, insects, algae,...) are excluded from the mixed sample. In forests precipitation is partially intercepted by the canopy (leaves and branches), where evaporation and canopy exchange processes take place. When the water has passed through the canopy and reaches the forest floor, it is called throughfall. In each Level II plot 10 identical throughfall collectors are installed. To sample throughfall water the same type of collector as for bulk precipitation is used. 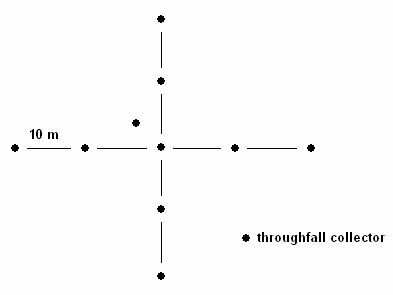 Throughfall samplers are positioned in each Level II plot in a systematic way, according to a north-south and east-west oriented line cross, with 1 collector in the plot centre and 2 collectors in each direction at a mutual distance of 10 m. The 10th collector is placed at 3 m from the central collector as illustrated in the figure below. Sampling is performed 2 times per month. The volume collected by each individual sampler is measured. Then the total volume collected by the 10 samplers is combined to a mixed sample, of which 500 ml is transported to the laboratory for chemical analysis. Samples which are visually contaminated (bird droppings, insects, algae,...) are excluded from the mixed sample. Part of the precipitation intercepted by the canopy will come down to the forest soil as stemflow. This is of particular importance for tree species with a smooth bark type, like beech. For tree species with a rough bark type, like oak and pine, the amount of stemflow is negligible compared to the precipitation volume. Therefore stemflow is only studied on beech trees in three of the Level II plots: Wijnendale and Hoeilaart (homogenous beech) and Gontrode (mixed oak-beech). In each of the two homogenous beech plots 5 beech trees were selected to study stemflow, in the mixed oak-beech plot 3 beech trees were selected. Trees were selected by diameter, according to the procedure described in the ICP-forests manual. Each of the selected trees was equipped with a PE collar attached to the stem to collect stemflow. The water first passes a 0.45 mm spaced mesh to prevent contamination of the sample (litter, insects,...) and then drains to a number of collecting barrels, connected by a cascade system. The amount of stemflow is determined 2 times per month by measuring the water volume in each barrel. 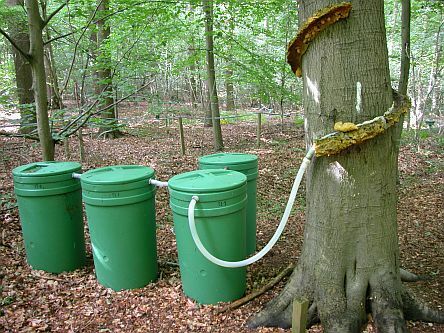 From each tree a certain amount of water (proportionally to the tree diameter) is combined to a mixed sample, of which 500 ml is transported to the laboratory for chemical analysis. In each plot 1 tree is also equipped with an automatic tipping bucket and datalogger, which registers the time and amount of stemflow accurately. 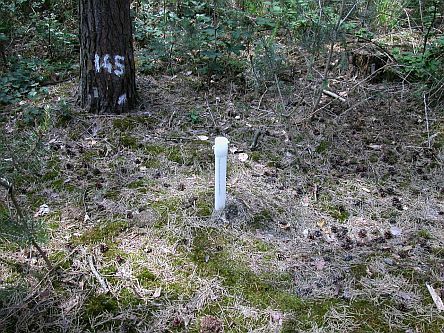 In each Level II plot fluctuations of the ground water table are followed up by means of 3 ground water level indicators. The ground water level is measured 2 times per month with an electronic gauging device.